One of my absolute favorite things about Charleston is how many different places there are to eat and drink. I've heard some crazy stat that you could go out to dinner every single night and not have to repeat a restaurant for over two years - wow! Even though I've only been living here for a year and a half, I still find myself getting in ruts when it comes to where to go out. I've found my favorite happy hours, sushi spots, Mexican joints, and fancy restaurants, where I know the food and drinks are good, so it's hard to try something new. Here's where Charleston Culinary Tours is the perfect solution: they host different food and drink-themed tours all over town, and each tour brings you to three or four restaurants and bars to sample different courses from their menus. A couple of weeks ago, Mike and I went on the Mixology Tour. After having tried the Upper King Street Culinary Tour and Distillery Tour, the Mixology Tour seemed like the perfect next step for our love of local spots and alcohol! 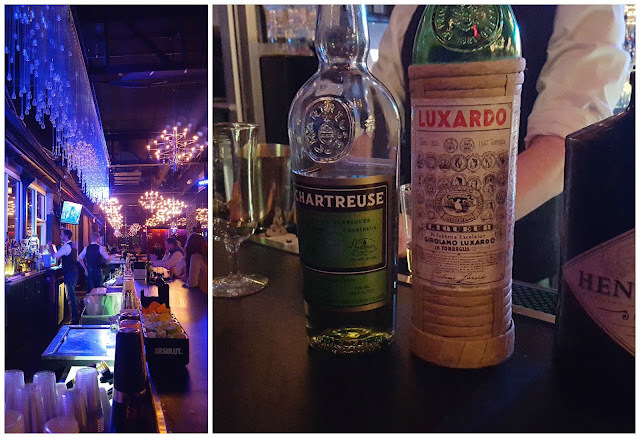 The one and a half hour tour stopped at three watering holes where we had the chance to meet the mixologists who are crafting Charleston's most exciting and delicious drinks. After discussing the art and craft of mixing cocktails and gaining insight into how Charleston's mixologists are embracing traditional techniques and combining them with new and innovative ingredients, we had the opportunity to sample specialty craft cocktails at each of the three locations. In between locations, our guide also taught us a lot about Charleston's cocktail culture and how it relates to the history of the city. We met our tour guide, Guilds, at our first stop, Prohibition, which was one of the stops on the original culinary tour we took. Over the last year, we've been back a few times for drinks and appetizers and absolutely love this spot. 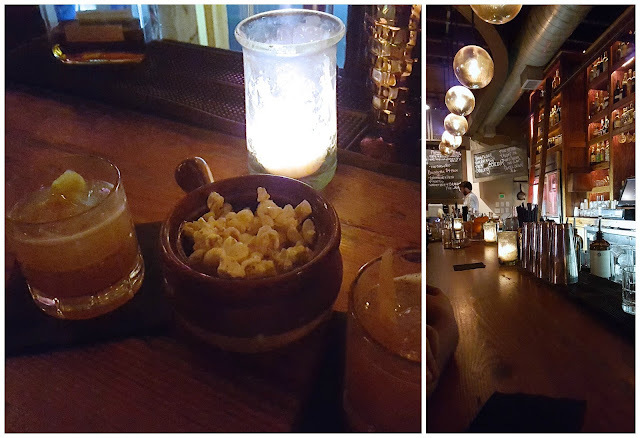 Since we'd been there before, bartender Ian asked us to each give him two of our favorite drinks from their award winning "hooch" menu. With Mike's favorite Moscow Mule and Bacon Maple Old Fashioned and my Strawberry Smash and Cloister in mind, Ian concocted us a fantastic drink made with vodka, allspice liqueur, Dubonnet, and orange bitters - his new-age take on a classic Manhattan. After finishing off our drinks, we headed out down King Street towards our next location. Along the way, Guilds told us a few fun facts about the area and each building's history. Arriving at The Cocktail Club, we climbed the stairs up to their main bar where we were greeted with their amazing bacon fat popcorn. Sounds weird and delicious, right?! The combination of buttery, sweet, and spicy is one-of-a-kind. At the bar, we also met Brett who made our second cocktail of the night: a Brown Derby. With fresh squeezed grapefruit juice, honey, and bourbon, this drink definitely warmed us up and was a great compliment to the popcorn. Our last stop only required a walk back down the steps and across the street to the Republic. After hearing that we already enjoyed vodka and bourbon, Wayne decided on The Last Word, an old fashioned cocktail with gin, chartreuse, maraschino liqueur, and lime juice. This was my favorite drink of the night, mostly because I never would have thought to order something like this on my own! Since the tour ended here, we decided to stick around and tried a few of their appetizers, sushi rolls, and other cocktails - all were delicious. My favorite aspect of the tour was the opportunity to meet and learn from different mixologists. 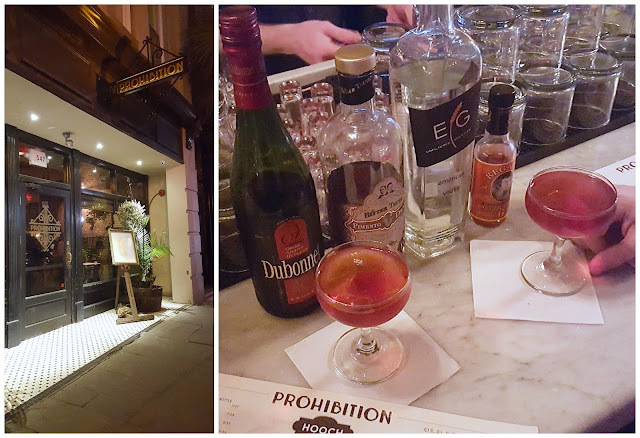 These Mixology tours are done early enough in the evenings that the bars are not at capacity and the bartenders really have time to talk to each of us on the tour. The mixologists we met each have a different technique and style when creating a cocktail. We had a chance to taste a lot of the ingredients that went into each cocktail to understand the complex flavors of each drink. Mike and I received complimentary admission to the Charleston Culinary Tours Mixology Tour through Eskimo Advertising in exchange for an honest review. All opinions are my own. This is so fun! Such a new and different way to explore the city! I love trying new restaurants all the time, but I hardly try new foods.. So it's just looking for the better chicken parm at different places haha .. Nice to see so many options where you live, we have a good amount as well in Boston and around the area! This is so cool! What a fun way to spend an evening! You always find the coolest things to do! I wish we had more choices when it comes to restaurants here. This sounds like so much fun-- what a cool way to learn a little bit more about each place you stopped in! This looks like so much fun! They took y'all to some great spots. That looks so fun, I love stuff like that. All those drinks sound delish! Is it 5 o'clock yet? Well this just looks super fun! How fun! Have you ventured out to the eats on Folly Island? I can't remember the name of it but there was one place that served up the best seafood and hushpuppies, etc. There's also a seafood place on the water in Charleston that had the best key lime pie. Man, I wish I were there, haha! This tour sounds like so much fun! I'm pretty sure I need to do this when I get to Charleston. I love this! I wonder if Portland has something similar... I think that last drink would've been my favorite too--I like gin and usually like lighter and fruitier drinks. This sounds like such a fun tour!! I was wondering how the mixology tour was, so I'm glad you tried it out! This is so fun. My husband and I love Prohibition! This sounds like something that I need to do in Charleston! You've been on top of finding all of the things that I want to try out the next time that I'm down there. Seriously, you two do the most fun things!! This looks like a blast! This sounds like so much fun! I need to see if we have any of these tours down here! So much fun!!! That is a tour to jump on! A strawberry smash sounds like a drink I really could enjoy!